So you want to shake hands like a real man? 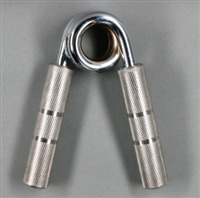 The crush grip is what most people immediately attribute to grip strength. It is the foundation that the human hand is built on. Hand shaking, swinging a bat or golf club, or holding on for dear life when riding your favorite roller coaster – its all crush grip. Since it’s used so often most people possess a decent amount of crush grip strength. It’s also the easiest to train for since it is so commonly used. The absolute best way to attain a bone crushing handshake is to work out using a gripper shown above. I wouldn’t suggest just any gripper though. The trick is to find grippers with multiple stages to slowly increase your strength. The grippers below are vastly popular and highly recommended! These Ironmind grippers have 10 levels to choose from. I’m not sure you need to purchase all 10 levels of grippers, but at least there is some variety. Now before we go any further, let me inform you that only a handful of human muscle freaks have closed the #4. Basically it’s unattainable by 99.9% of the human race. Don’t waste your time unless you’re training to be an elite among grip strength enthusiasts. The average male is capable of 112-pounds of crush grip strength. With that being the case I would suggest you purchase the #1 or #2 so you have something to grow into. If you can repeatedly close the #2 gripper you’re gonna be able to put most men on their knees with your handshake. These grippers are very affordable at only $20. Crush grip is one of the easiest grip strengths to train. When you first start out training your crush grip with a gripper you should force yourself to close it about 5 times per day. If you purchased a gripper you’re not able to close, don’t worry. You need to force yourself to close it every time. By force I mean use another part of your body, like your leg, to force the gripper to close completely. After a couple weeks time you should increase your reps to about 10 per day. In another two weeks you should test out your new found crush grip by greeting your buddies with a knee buckling handshake. Why do you train your grip? Do you lift weights too? Btw, an Ivanko Super Gripper is probably a better tool for beginners: more options, cost less. Ironmind has also 1.5/2.5 grippers available now. Wow can people really grip those? 365 pounds, oh my goodness I don’t think I could do it. Wow and people use that tool for training. If there’s a grip strength competition then it would be so fun to watch (or not so fun since people just gripping each other). Sports authority sells the 50# grip which is good for grip endurance as you will need to do more reps with it. A 75 lb. grip is really easy. i’m workin with 140 lbs. right now and im only 19. I’m 15 and use heavy grips and can do the 200. They are better I think. Did you fail to mention your 6,5 250lb Olympic weight lifter whose been training since he was 10? BTW you train all aspects of anything to become stronger faster better at what ever you do. Hand strength is a sign of and a part of true manhood. We not only lead, provide, educate but protect also.